Summary: What does the SAE J2601 say? What is the MC Method and when can you use it? You want to plan and build a hydrogen filling station? I am David Wenger, Managing Director of Wenger Engineering GmbH and one of the main authors of the standard SAE J2601. As author of the standard, it felt to me like I was in Detroit a hundred times. I discussed with car manufacturers and gas companies from all over the world in order to finally discuss with my team that created the mathematical simulation model that was the basis for all calculations and tables. This simulation model has been validated extensively and has since become the global benchmark for hydrogen refueling. As you may have noticed, reading, understanding and using the SAE J2601 is not that easy. I think we agree on that. 1. You try and test until you are either fed up or it does somehow work. Therefore, let me suggest two things: You can find an e-book that explains the most important aspects of the SAE J2601 and helps you to identify the key points and to work with them correctly on this website. You should download this e-book. Secondly, I can offer you to talk about how I would solve the problem. I have already seen a lot after more than 14 years of experience and around 150 worldwide projects in the field of hydrogen storage and filling station technology. Send me a mail or give me a call. The contact details can be found under the video. The quickest way is, however, to briefly contact my colleagues in the chat that you can find on the right side. They can arrange a phone call. Download the e-book for free, read it, arrange a phone call over the chat. Nothing can go wrong then. Deal? Wenger Engineering GmbH is a R&D service provider for thermodynamics, fluid mechanics and process engineering. The focus of the projects has been in the field of hydrogen technology since the formation of the company. In about 150 projects for companies such as Daimler, Toyota, Honda, Bosch, Linde, Shell or Hexagon, the team of Wenger Engineering GmbH has successfully worked on topics like hydrogen storage (700 bar, LH2, chemical storage, components), fueling stations technology, standardization, hydrogen purity, fuel cell system technology etc. A worldwide known project is the SAE J2601. In this standardization committee, Wenger Engineering GmbH was in charge of all simulations. In addition, Wenger Engineering GmbH has implemented numerous projects to optimize fueling of fuel cell buses, trains and other hydrogen-powered vehicles. 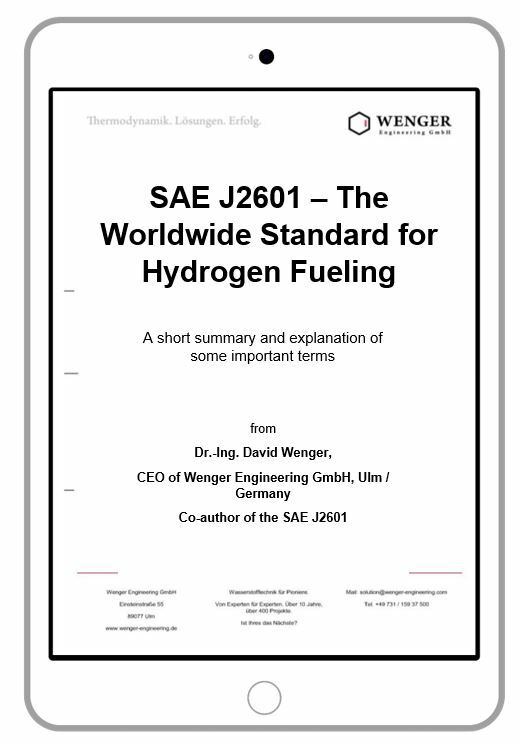 This little e-book should help you to understand the extensive and complex SAE J2601 even better and to know Wenger Engineering GmbH as an additional helper at your side if necessary.